Last week in Undertrays, Spoiler & Bonnet Vents, Part 2 we showed you how a newly-fitted undertray dropped the underbonnet pressure build-up on our guinea pig Maxima V6 turbo by 75 per cent at 80 km/h, considerably improving flow through the intercooler and radiator. But the pesky under-bonnet pressure build-up still occurred and got even higher when the car was driven faster. Bonnet vents are openings designed to exhaust air – to promote the flow of air out from under the bonnet. As covered in detail in Part 1 of this series (Undertrays, Spoiler & Bonnet Vents, Part 1), air movement will occur only when there is a pressure differential. So, to cause air to flow out from under the bonnet, what’s needed is an underbonnet pressure that is greater than the pressure on top of the bonnet... at the exact location where the vent is. Pressure on top of the bonnet? Why would there be any? 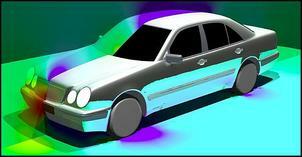 The pressure on the surface of the bodywork depends on the aerodynamic flows over it. This DaimlerChrysler graphic shows the typical frontal pressure distribution of a car. Looking just at the bonnet you can see that there is low pressure (blue) where the air wraps around the leading edge of the bonnet, grading to high pressure (green) as the air reaches the obstruction which is the windscreen. So you wouldn’t site a bonnet outlet vent close to the windscreen – in fact that’s usually where the cabin ventilation inlet ducts are... they’re taking advantage of that high pressure! Looking at just the exterior pressures, what we want at the vent location is the very lowest external pressure. That’s the theory – but what about on the road? By using the Magnehelic gauge (see the previous parts in this series for more on these gauges), it’s dead-easy to directly measure the pressures over the outside of the bonnet. Simple run a tube from the Magnehelic gauge to the area to be measured, making sure that the open end of the tube is at right-angles to the direction of airflow. Leave the other port of the gauge open, and swap the tube from port to port, depending on whether you find that you’re measuring a high or low pressure. This is exactly what we did on the Maxima, using the same 80 km/h road speed for all testing. The results were astounding – not because they reflected the textbook example shown in the graphic above, but because the pressure variations were so great! As can be seen here, the front half of the bonnet surface was clearly a negative pressure zone, while the rear half was all in positive pressure. And the further forwards the measurements were taken, the lower the pressure; and the further backwards, the higher the pressures! Clearly, the further forward that the vents were to be placed, the lower the available outside pressures. But the outside pressures are literally only half the story. What about the underbonnet pressures? As mentioned above, with the new-design undertray in place, the maximum pressures under the bonnet (again at 80 km/h) was 0.4 inches. This was recorded across the rear half of the engine bay. At the front of the engine bay (in reality, about 30cm back from the radiator), the underbonnet pressure was 0.1 inches. For reasons of aerodynamic drag (which we’ve not touched on at all in this series), it is normal to direct the air out of vents as parallel to the surface as possible. This causes least turbulence. But of course bonnet vent selection also depends on issues like price, durability and aesthetics – bonnet vents are much more visible than undertrays! Taking into account all of these factors, I purchased from a boating supplies shop (Whitworth’s Nautical World) some stainless steel louvred vents. These were 325 x 111mm and cost AUD$19.50 each. I then reconsidered. What was really required was a vent that could be mounted east-west, ie across the bonnet. This would be best sited as far forward as possible: realistically, about where -0.3 surface pressure existed. In fact, the shape of the vent wouldn’t be all that different to a ventilation inlet grille at the base of the windscreen – except it would be sited a long way forward and exiting (rather than entrancing) air. A trip to the wreckers and a long walk around the yard found the ideal vents – the ventilation inlet vents on a Holden VL Commodore, which are normally positioned in the trailing edge of the bonnet. The cost was AUD$10 for the pair. 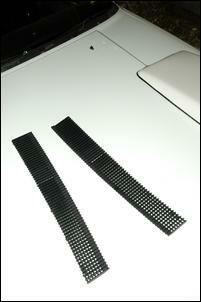 The Commodore vents come in two pieces. If required – as was the case here – they can be shortened by chopping off a section at each end. (The vent assembly is slightly curved in plan, so this keeps their symmetry.) A hacksaw was used to do this then an electric jigsaw was used to cut out the long, mostly rectangular hole in which they sat. 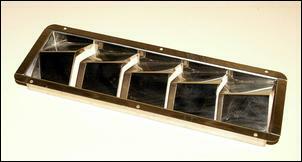 Some metal clips (made from ‘eye’ electrical terminals) and double-sided tape were used to hold them in place. In this case the underbonnet pressure itself didn’t concern me all that much – I wanted as much airflow through the intercooler as possible and that would depend on the pressures each side of the ‘cooler! However, underbonnet pressures were measured first. Yes, as can be seen in the above table, the measured pressure differential across the intercooler at 80 km/h averaged 0.4 inches – up from 0.3 without the bonnet vent. 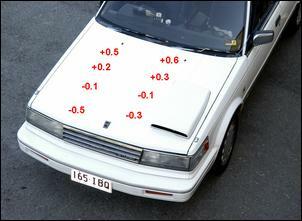 But if the underbonnet pressure was unchanged, where did the extra difference come from? The answer is in the ‘average’ prefix – the new difference ‘averaged’ 0.4 inches. Prior to the bonnet vent being installed, the pressure differential across the intercooler was fairly stable at 0.3 inches of water. 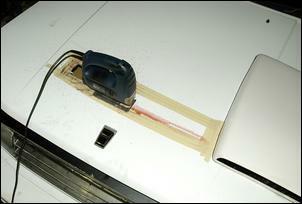 But with the bonnet vents installed, even the slightest gust of wind caused the pressure differential to leap. Driving through some hilly urban areas on what was apparently a calm day, tiny gusts of wind took the pressure difference as high as 0.6 inches! This lifted my subjective ‘average’ figure from 0.3 to 0.4 inches of water. This effect could also be observed at higher speeds – the pressure differential increased considerably as the car went faster, whereas before the bonnet vent was installed, the pressure difference across the intercooler had remained pretty well constant. Over having no undertray at all, the fitting of the new undertray and bonnet vent have lifted the pressure difference across the intercooler from minus 0.1 to plus 0.4 inches of water. Or to put it another way, the pressure difference across the intercooler has been increased by a factor of five! You can't therefore say that there's now five times as much external airflow through the intercooler at 80 km/h, but you can be sure that it has risen considerably. The measured intake air temp certainly shows that the intercooler is now working far better. In this series we’ve given you a heap of figures – perhaps too many. 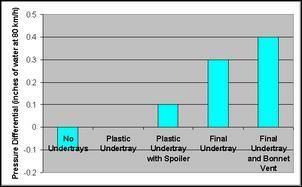 But in the area of DIY aerodynamic modification, there is always a lot of talk, very little action – and never any data! We hope that we’ve helped address that problem – and remember, all you need is a cheap Magnehelic gauge and you can collect figures for your own car. The bottom line: the Maxima now boasts far improved intercooler efficiencies and noticeably improved radiator performance from two aerodynamic mods that together cost AUD$38.